On November 25, 1986, James Beam retired as Mayor of Orange after serving for six and one half years, the longest tenure in the nearly 100 year history of the city of Orange. His total service on the City Council including a term as Councilman and as Mayor pro tern, totaled more than 10 years. 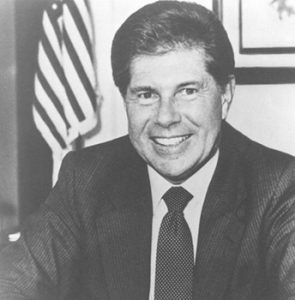 During his tenure as Mayor, Jim represented the 26 cities of Orange County as a Commissioner on the Orange County Transportation Commission, was a founding member of the Board of Directors of the South Coast Air Quality Management District and a founding board member of the Eastern and Foothill Transportation Corridors Joint Powers Authorities. He served as Chairman of the City Selection Committee composed of the mayors of the 26 cities of Orange County charged by state law with making appointments to various county and regional governmental boards and commissions. In addition, Jim Beam has served as either chairman or president of many other organizations including the Orange County Chamber of Commerce, the Orange County Estate Planning Council, the World Affairs Council of Orange County, Concordia University Irvine Foundation and the President's Council of Chapman University. Jim Beam has been active in real estate for 35 years. He is founder, Chairman and Chief Executive Officer of Beam & Associates, a real estate consulting firm headquartered in Orange, California. Before launching Beam & Associates, he was Executive Director of the Orange County region of the Building Industry Association of Southern California and was Vice President of the First National Bank of Orange County. Prior to joining the bank, he was founding partner of a real estate brokerage firm. Jim Beam was the 1986 President of the 28th annual Pacific Coast Builders Conference. He is a past recipient of the Conference's Gold Nugget Merit Award. Honors and Awards: Named Outstanding Public Official in Orange County by the American Society for Public Administration in 1985; U .S. Mayor of the Year by the national "We Tip" organization; Recipient of the William Spurgeon III Award from the Boy Scouts of America; Named Orange "Man of the Year;" Honorary Life Member of the Orange Chamber of Commerce and of Wycliffe Associates, Honorary Life Member of the lay auxiliary of Wycliffe Bible Translators; Past recipient of the Civic Leadership Award from the Southern California Division of the Salvation Army; and Paul Harris Fellow of Rotary International.